When completed this project will address traffic congestion and improve conditions for pedestrians, cyclists, and motorists. 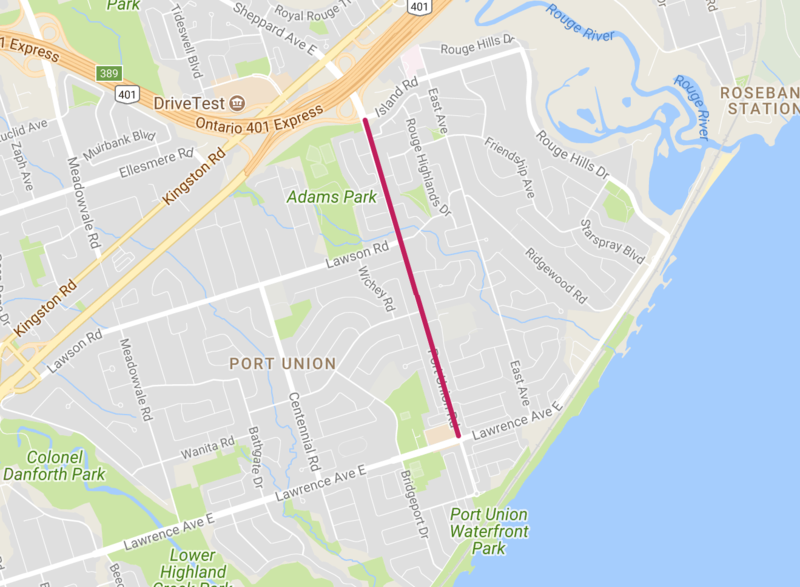 As part of the Port Union Road Improvements project, site investigations to locate gas mains will take place at several locations along Port Union Road. Testing is done so the design and planned work will not affect existing gas mains. This work will commence on Tuesday, February 19 and is expected to take between three and seven days to complete. For additional information, please view the work notice below. In 2017, the City conducted field investigations including a survey of the area and analysis of soil samples in various locations along Port Union Road to confirm ground conditions. Based on the results, the City is developing the project design. Once the design is finalized, the City will provide further details on a construction start date. The Environmental Assessment (EA) for this project was planned and approved in 2004. A subsequent EA Addendum (update) was completed and approved in 2015 and made changes to the original study design in order to reduce property and community impacts. The Addendum (update) to the 2004 ESR was approved by the Ministry of Environment and Climate Change (MOECC) in August 2015. To view the Environmental Assessment Addendum Report, contact Andrew Plunkett at 416-397-1968 or Andrew.Plunkett@toronto.ca.